You can count me as one of the approximately bajillion fans that have been waiting ever so patiently for Rihanna and Drake to do the damn thing and finally get together. So, now that they actually have made things, how do I put this, unofficially official — I mean, what else can you call Drake's VMAs ode to Rih Rih? — I get that it might be almost too much goodness for us wide eyed Aubrih shippers to handle. I was having a tough time handling it myself. Like, we've peaked, guys. This is it. Where do we go from here? How do we deal with Drake and Rihanna (reportedly) dating? Listen, I wasn't the best in science class, but I do know that energy is "neither created nor destroyed," meaning we have to channel all that anticipatory energy into something other than pining for an Aubrih relationship now, you know? Because it's here. We are living it. To Drake and Rihanna's credit, since making things way, way more public than ever — for instance, those tattoos; that onstage kiss — Drake and Rihanna have been giving us lots of fodder to fangirl and fanboy over, so that's definitely one outlet for our slightly obsessed and overjoyed minds to focus on. But the fact remains that many of us fans probably aren't sure how to handle all of this without spontaneously combusting into a thousand, tiny, heart-shaped pieces. So, if you aren't sure how to deal with the Aubrih awakening because you're just too damn happy, here's a helpful guide. Let's be real, it's what the unabashedly sensitive Drake would want. As they say, the only way out is through. Happy tears, though. As Hamilton's Eliza Schuyler would say, "Look at where we are. Look at where we started." It helps to stick your finger directly in any Aubrih naysayers face and proclaim, "I told you so!" while showing them a picture of the billboard Drake dedicated to Rihanna. 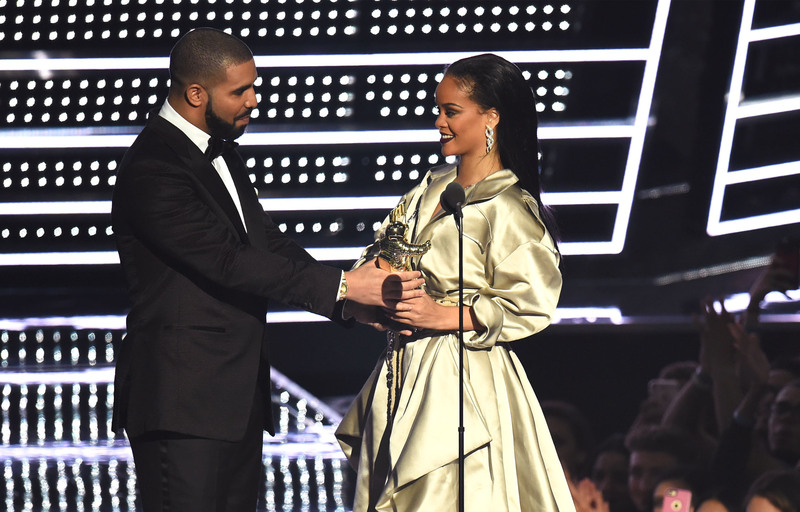 Watch a clip of Drake publicly declare his love for Rihanna on national television enough times that you're sure it isn't one of Ashton Kutcher's elaborate, eleventh hour Punk'd schemes. Because, undoubtedly, the best therapy is music. Their music. Like, the reports that they got matching tattoos (Rihanna's, above, is from Bang Bang). Take a deep breath, they're in it for the long haul. We can all relax... I think. The rules of this how-to guide: Rinse and repeat. I assume many Aubrih-related freak outs will abound in the future.